GoLite says:"Achieves the fine balance between great warmth, good looks and packability. Our 650+ fill power down is 15% loftier than the industry standard 550+ fill power down and exhibits excellent compressibility and recovery characteristics. We process it to an 85/15 cluster to feather ratio to emphasize maximum recovery from compression." 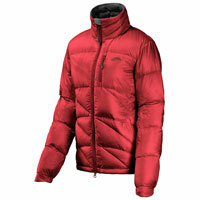 The GoLite Beartooth 650 is a great looking, light-weight insulating jacket. The fit was true to size. I'm 5'7'' and usually a standard 12 - I was wearing the Medium which provided ample room for both a baselayer and midlayer underneath it. Both the overall body length and sleeve length were good - I often find sleeves to be slightly too short so it was nice to find a garment that does have a generous sleeve length. The Beartooth certainly kept me warm - I've worn it as the outer layer combined with a good mid-layer in temps of about 6 degrees C. It's also worked really well underneath my usual waterproof jackets in colder weather. The collar, which has a comfy soft lining, zips right up over your chin which was great in cold winds. The hem is also adjustable which means you can get an even snugger fit if necessary. The freedom of movement is good - during higher energy periods the two way zip provides an alternative, convenient, quick ventilation option. There is also a good selection of pockets; outside there are two cosy, zipped hand-warmer pockets at the lower side front plus a zipped front (mp3 player.phone-sized) pocket at the front. Inside there is one small, zipped pocket for car keys etc. All the external pockets have tagged zips which are easy to open with gloved hands. The Beartooth packs down easily into its own small stuff-sack from which it re-emerges ready to wear. A really good looking, warm yet very light-weight weight jacket that's perfect for when you need some extra warmth either on the hill - or around town. It's not cheap but its versatility and performance make it an investment worth considering for autumn/winter/spring wear.